A pretty good place to find information on gardening. Some stuff isn't new for advanced gardeners, but the podcasts on beneficial bugs and predatory insects are incredible, and kind of life changing! 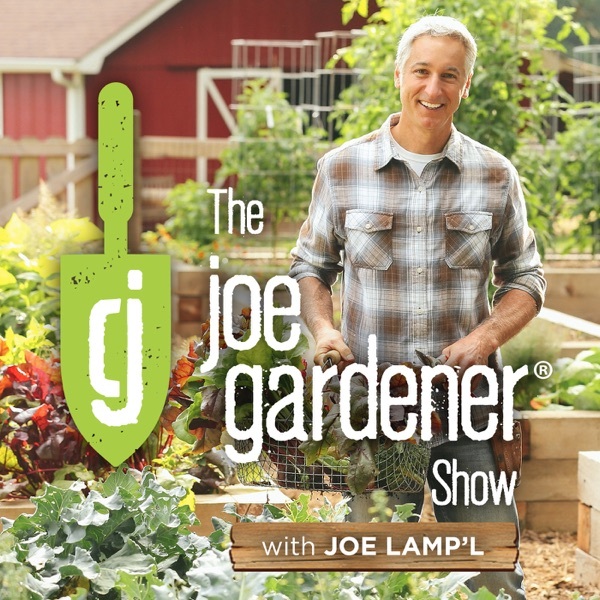 The joe gardener Show is a podcast all about learning to be a better, smarter gardener and hosted by national gardening expert and PBS television host, Joe Lamp'l. Interviews include the leading authorities in their specialty with an emphasis on organic gardening, growing food, and creating a wildlife-friendly habitat. The post 101-A Way to Garden: Observations and Lessons, with Margaret Roach appeared first on joe gardener® | Organic Gardening Like a Pro. The post 100-Understanding Cover Crops: The Basics and Beyond, with Jack Algiere appeared first on joe gardener® | Organic Gardening Like a Pro. The post 099-Understanding Crop Rotation: The Basics and Beyond, with Jack Algiere appeared first on joe gardener® | Organic Gardening Like a Pro. The post 098-Uncommon Fruits for Every Garden with Lee Reich appeared first on joe gardener® | Organic Gardening Like a Pro. The post 097-Spring Tips for Vegetable Garden Success appeared first on joe gardener® | Organic Gardening Like a Pro. The post 096-Tips for Fruit Growing Success: Selection, Maintenance & Advice, with Dr. Lee Reich appeared first on joe gardener® | Organic Gardening Like a Pro. The post 095-Tomato Seed Starting Update: Innovations and Inspiration, with Craig LeHoullier appeared first on joe gardener® | Organic Gardening Like a Pro. The post 094-How to Start and Care for Seedlings Indoors: My Steps for Success appeared first on joe gardener® | Organic Gardening Like a Pro. The post 093-Hobby Greenhouse Considerations: What to Know Before You Buy (and After You Do) appeared first on joe gardener® | Organic Gardening Like a Pro. The post 092-Vegetable Planting Timeline & More: Joe Lamp’l Responds to Listener Questions appeared first on joe gardener® | Organic Gardening Like a Pro. The post 091-Starting Seeds Indoors: The Non-Negotiables for Success, Pt. 1 – Encore Presentation appeared first on joe gardener® | Organic Gardening Like a Pro. The post 090-Catching up with Paul James, Superstar of HGTV’s Gardening by the Yard appeared first on joe gardener® | Organic Gardening Like a Pro. The post 089-Composting Guide A to Z: The Quick and Dirty on Everything Compost – Encore Presentation appeared first on joe gardener® | Organic Gardening Like a Pro. The post 088-The New Organic Grower: 50-Years in the Making, with Eliot Coleman appeared first on joe gardener® | Organic Gardening Like a Pro. The post 087-An Interview With Joe Lamp’l: What You Didn’t Know About the Joe Behind joe gardener appeared first on joe gardener® | Organic Gardening Like a Pro. The post 086-Timeless Gardening Principles, with Barbara Damrosch appeared first on joe gardener® | Organic Gardening Like a Pro. The post 085-Organizing Your Gardening Life – Encore Presentation appeared first on joe gardener® | Organic Gardening Like a Pro. The post 084-What Happened to the G in HGTV? – Encore Presentation appeared first on joe gardener® | Organic Gardening Like a Pro. The post 083-Gardening Indoors: The Science of Light, with Leslie Halleck appeared first on joe gardener® | Organic Gardening Like a Pro. The post 082-Finding the Best of the Best Gardening Products and Tools appeared first on joe gardener® | Organic Gardening Like a Pro. The post 081-Growing Indoors: The Basics of Houseplant Care and Maintenance appeared first on joe gardener® | Organic Gardening Like a Pro. The post 080-Putting the Garden to Bed: End-of-Season Advice from Margaret Roach appeared first on joe gardener® | Organic Gardening Like a Pro. The post 079-Foodscaping: How to Create an Edible Landscape, With Brie Arthur appeared first on joe gardener® | Organic Gardening Like a Pro. The post 078-Why Buy Organic Seeds: Fixing a Broken Food System, with Tom Stearns of High Mowing Seeds appeared first on joe gardener® | Organic Gardening Like a Pro. The post 077-The Beauty and Importance of Native Plants: The Ethos of Mt. Cuba Center appeared first on joe gardener® | Organic Gardening Like a Pro. The post 076-How to Create a Bird-friendly Yard appeared first on joe gardener® | Organic Gardening Like a Pro. The post 075-Top Questions for Composting at Home: You Asked, Joe Lamp’l Answers appeared first on joe gardener® | Organic Gardening Like a Pro. The post 074-How to Have and Care for a Healthy Lawn: Top 7 Non-negotiables appeared first on joe gardener® | Organic Gardening Like a Pro. The post 073-How to Create a Resilient Garden: 10 Key Principles appeared first on joe gardener® | Organic Gardening Like a Pro. The post 072-Creating an Eco-friendly Garden & Landscape: 7 Key Tenets appeared first on joe gardener® | Organic Gardening Like a Pro. The post 071-Gardening for Wildlife: How-to Create an Inviting Habitat, with NWF’s David Mizijewski appeared first on joe gardener® | Organic Gardening Like a Pro. The post 070-Decoding Garden Advice: Good, Debatable or Just Plain Wrong, with Jeff Gillman appeared first on joe gardener® | Organic Gardening Like a Pro. The post 069-The Fascinating Facts Behind the Plants We Eat, with Jeff Gillman appeared first on joe gardener® | Organic Gardening Like a Pro. The post 068-Top Predatory Beneficial Insects and How to Attract Them, Pt. 2 appeared first on joe gardener® | Organic Gardening Like a Pro. The post 067-Predatory Beneficial Insects: Feared Foes of Garden Pests, Pt. 1 appeared first on joe gardener® | Organic Gardening Like a Pro. The post 066-Tomatoland: The Dirty Truth of the Tasteless Tomato, with Barry Estabrook appeared first on joe gardener® | Organic Gardening Like a Pro. The post 065-Tips For Reducing Garden Overwhelm, With Margaret Roach appeared first on joe gardener® | Organic Gardening Like a Pro. The post 064-Tomato Growing Season Lookback: Lessons Learned With Craig LeHoullier appeared first on joe gardener® | Organic Gardening Like a Pro. The post 063-Garden Fertilizer Basics: What to Know Before You Grow appeared first on joe gardener® | Organic Gardening Like a Pro. The post 062-Great Garden Reads: Must-Have Books For Every Gardener appeared first on joe gardener® | Organic Gardening Like a Pro. The post 061-A Day In The Life At The GardenFarm: Audio Journal Encore Edition appeared first on joe gardener® | Organic Gardening Like a Pro. The post 060-How to Control Nuisance Wildlife in the Garden: Deer, Rabbits, Moles & More appeared first on joe gardener® | Organic Gardening Like a Pro. The post 059-Learning the Business of Horticulture: Using Education With Innovation For New Opportunities appeared first on joe gardener® | Organic Gardening Like a Pro. The post 058-Biochar Basics and More: Digging Deeper Into the Science of Soil appeared first on joe gardener® | Organic Gardening Like a Pro. 057-What Happened to the G in HGTV? The post 057-What Happened to the G in HGTV? appeared first on joe gardener® | Organic Gardening Like a Pro. The post 056-Tomato Care Checklist with Craig LeHoullier appeared first on joe gardener® | Organic Gardening Like a Pro. The post 055-Vacation Preparation For Plants: What To Do Before You Go appeared first on joe gardener® | Organic Gardening Like a Pro. The post 054-Plastic Nursery Pots – Greening Up The Darkest Side of Gardening appeared first on joe gardener® | Organic Gardening Like a Pro. The post 053-Waterwise Gardening With Nan Sterman appeared first on joe gardener® | Organic Gardening Like a Pro. The post 052-Why Organic Matters – with Maria Rodale appeared first on joe gardener® | Organic Gardening Like a Pro. The post 051-How to Grow Bountiful Blueberries – Key Steps with Lee Reich appeared first on joe gardener® | Organic Gardening Like a Pro. The post 050-Organic Pest Control: Beneficial Insects And Beyond appeared first on joe gardener® | Organic Gardening Like a Pro. The post 049-When Good Bugs Eat Bad Bugs: The Business of Beneficial Insects appeared first on joe gardener® | Organic Gardening Like a Pro. The post 048-The Simple Science Behind Great Gardening, with Lee Reich appeared first on joe gardener® | Organic Gardening Like a Pro. The post 047-Tomato Seedling Mistakes with Craig LeHoullier appeared first on joe gardener® | Organic Gardening Like a Pro. The post 046-Organizing Your Gardening Life appeared first on joe gardener® | Organic Gardening Like a Pro. The post 045-Succession Planting: Practical Tips For Growing More Food appeared first on joe gardener® | Organic Gardening Like a Pro. The post 044-Raised Bed Gardening, Pt. 3: Animal Control & More appeared first on joe gardener® | Organic Gardening Like a Pro. The post 043-Raised Bed Gardening, Pt. 2: Perfect Soil Recipe appeared first on joe gardener® | Organic Gardening Like a Pro. The post 042-Raised Bed Gardening, Pt. 1: Getting Started appeared first on joe gardener® | Organic Gardening Like a Pro. The post 041-Small Space Garden Design appeared first on joe gardener® | Organic Gardening Like a Pro. The post 040-Prepping Your Garden For Spring: 10 Things To Do Now appeared first on joe gardener® | Organic Gardening Like a Pro. The post 039-How-to Start Seeds Indoors: Digging Deeper, Pt. 3 appeared first on joe gardener® | Organic Gardening Like a Pro. The post 038-How to Start Seeds Indoors: The Non-Negotiables for Success, Pt. 2 appeared first on joe gardener® | Organic Gardening Like a Pro. The post 037-Starting Seeds Indoors: The Non-Negotiables for Success, Pt. 1 appeared first on joe gardener® | Organic Gardening Like a Pro. The post 036-Gardening Myths BUSTED, Pt. 3 with Linda Chalker-Scott appeared first on joe gardener® | Organic Gardening Like a Pro. The post 035-Gardening Myths BUSTED, Pt. 2 with Linda Chalker-Scott appeared first on joe gardener® | Organic Gardening Like a Pro. The post 034-Gardening Myths BUSTED, Pt. 1 with Linda Chalker-Scott appeared first on joe gardener® | Organic Gardening Like a Pro. The post 033-Savvy Seed Catalog Shopping appeared first on joe gardener® | Organic Gardening Like a Pro. The post 032-What’s Ahead for 2018 appeared first on joe gardener® | Organic Gardening Like a Pro. The post 031-Botanical Latin 101: The Non-Geek’s Guide to the Language of Plants appeared first on joe gardener® | Organic Gardening Like a Pro. The post 030-Best Gardening Products Ever: Gear, Tools & Resources We Can’t Live Without appeared first on joe gardener® | Organic Gardening Like a Pro. The post 029-My Five Biggest Gardening Mistakes of All Time (and What I Learned From Them) appeared first on joe gardener® | Organic Gardening Like a Pro. The post 028-The Role of Minerals in Making Great Soil appeared first on joe gardener® | Organic Gardening Like a Pro. The post 027-Changing the Way America Eats with Dan Barber appeared first on joe gardener® | Organic Gardening Like a Pro. The post 026-Using Leaves as Mulch & Compost (and Why Leaves Change Color & Shed) appeared first on joe gardener® | Organic Gardening Like a Pro. The post 025-Five of the Biggest Mistakes in Tree Care appeared first on joe gardener® | Organic Gardening Like a Pro. The post 024–Japanese Maples: A Passion and Profession with Matt & Tim Nichols appeared first on joe gardener® | Organic Gardening Like a Pro. The post 023-Attracting and Protecting Pollinators with Eric Mader appeared first on joe gardener® | Organic Gardening Like a Pro. The post 022-The Year-round Vegetable Gardener with Niki Jabbour appeared first on joe gardener® | Organic Gardening Like a Pro. The post 021-How Plants Work with Linda Chalker-Scott (The Science behind Plants) appeared first on joe gardener® | Organic Gardening Like a Pro. The post 020-Gardening for the Birds with Margaret Roach appeared first on joe gardener® | Organic Gardening Like a Pro. The post 019-GardenFarm Audio Journal – First Day of Fall, 2017 appeared first on joe gardener® | Organic Gardening Like a Pro. The post 018-HGTV’s A Gardener’s Diary with Erica Glasener appeared first on joe gardener® | Organic Gardening Like a Pro. The post 017-The Five Biggest Mistakes Gardeners Make appeared first on joe gardener® | Organic Gardening Like a Pro. The post 016-Composting Guide A to Z: The Quick and Dirty on Everything Compost appeared first on joe gardener® | Organic Gardening Like a Pro. The post 015-Life Lessons on Gardening and Design with Margaret Roach appeared first on joe gardener® | Organic Gardening Like a Pro. The post 014-Top Tips for Saving Money in the Garden appeared first on joe gardener® | Organic Gardening Like a Pro. The post 013-Backyard Composting – Confessions of an Obsessed Composter with Lee Reich appeared first on joe gardener® | Organic Gardening Like a Pro. The post 012-Beneficial Garden Insects – Bringing Nature Home with Doug Tallamy appeared first on joe gardener® | Organic Gardening Like a Pro. The post 011-Plant Propagation Basics – With Brie Arthur appeared first on joe gardener® | Organic Gardening Like a Pro. The post 010-Preserving the Harvest with Theresa Loe appeared first on joe gardener® | Organic Gardening Like a Pro. The post 009-Organic Disease Control with Jeff Gillman appeared first on joe gardener® | Organic Gardening Like a Pro. The post 008-Organic Pest Control with Jeff Gillman appeared first on joe gardener® | Organic Gardening Like a Pro. The post 007-Organic Weed Control with Jeff Gillman appeared first on joe gardener® | Organic Gardening Like a Pro. The post 006-Weedless Gardening with Lee Reich appeared first on joe gardener® | Organic Gardening Like a Pro. The post 005-What’s Wrong With My Tomato? Mid-Season Care With Craig LeHoullier appeared first on joe gardener® | Organic Gardening Like a Pro. The post 004-Heirloom Tomatoes: Past, Present and Future with Craig LeHoullier appeared first on joe gardener® | Organic Gardening Like a Pro. The post 003-Growing Epic Tomatoes with Craig LeHoullier appeared first on joe gardener® | Organic Gardening Like a Pro. The post 002-Vegetable Garden Tips – Five Steps to Your Best Garden Ever appeared first on joe gardener® | Organic Gardening Like a Pro.